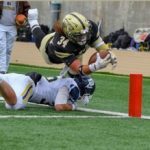 On my way to becoming Nebraska Wesleyan's all-time leading rusher, I had to overcome doubts and at times, that was very difficult. Most importantly, I had to accept and embrace change. You see, when I was a little kid, all I could think about was playing basketball in college and the NBA. Despite playing football in high school, my focus was elsewhere. I constantly asked myself what I needed to do to become a big-time basketball player. Many of my friends and family members tried to convince me that my skills were better suited to play football. But at that time, this just wasn't something I was interested in. 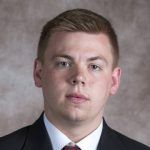 So, even after receiving a letter from Coach Bo Pelini at Nebraska to join the Huskers as a walk-on, my mindset didn't change. And as a result, I committed to Northeast Community College to play Basketball. But committing to basketball didn't prevent people from trying to make me pursue a career in football. One day, I got called to replace a kid in the Nebraska Shrine Bowl which is the annual all-star football game for graduating high school seniors. During the entire event, the football coaches continued to tell me that my future in football wasn't over and that I needed to consider it more. Not only did I more and more realize what I was missing out on, but this is also where I first met Nebraska Wesleyan's football coach, Brian Keller. Coach Keller and I immediately connected. He told me that he believed I would have a good chance on his team to play an integral part from the get-go. And frankly, this really made me think. After this conversation and an opportunity to play in a second Shrine Bowl, I fell in love with football again. So, I called up coach Keller and told him I was in. One thing that has always motivated me throughout my football journey is other people's doubts. From the very beginning of Pop Warner Football, I was told that I was too small and too slow to play my favorite position, quarterback. I got stuck being a lineman and even a linebacker. But since they labeled me too small, I basically never saw the field. Back home in South Dakota, for example, I was told many times that I would never make it to the next level. It wasn’t until I was given a chance that people realized... I could actually do the job. At my high school, Lutheran High Northeast, I helped them to a 27-6 record and became the school's leading rusher. The system we ran made the choice of playing running back a little easier. Also, having played this position in two all-star games really solidified it. I contribute all of my success to my incredible teammates, coaches, and friends. They all made my time at NWU so valuable. But there were very challenging times. Early on, I had my fair share of struggles and once I got hurt, I felt miserable. The year I tore my meniscus was one of the toughest periods I had to overcome in my life. Sure, I was forced to miss games in my life before but I never had to sit out an entire season. Getting hurt on the third day of practice and being expected to not return until week eight was heartbreaking, to say the least. 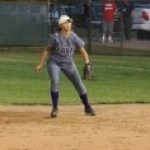 I was depressed for quite some time and really struggled to find the motivation to attend practices or games. It was just too painful to accept that I couldn't be out there helping. In my first game after a long rehab process, I dislocated my elbow, tore my UCL, and was forced to sit out the rest of the second half as well as the entire next game. I was going insane, literally. But I was able to brace it up and, with the help of my teammates, eventually became the university's first 1,000-yard rusher since 2005. The year after my injury, however, everything turned around for me emotionally and I started to connect with my team on a level that is hard to describe. That following off-season, we had 6 a.m. workouts four times a week. I lifted every single day alongside two of my best friends. 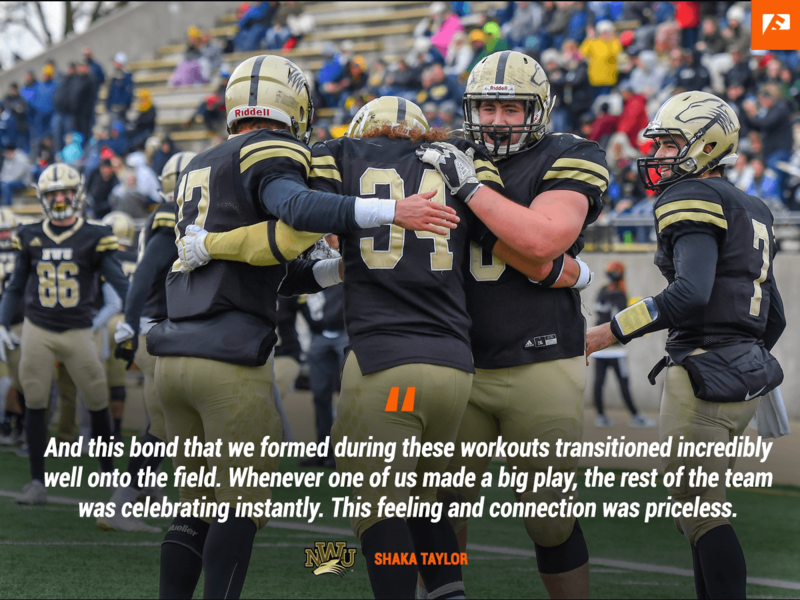 And this bond that we formed during these workouts transitioned incredibly well onto the field. Whenever one of us made a big play, for example, the rest of the team was celebrating instantly. This feeling and connection were priceless. This Wesleyan community made for memories that are going to stick with me forever. Overall, being a Prairie Wolf was an unbelievable experience that I will embrace for the rest of my life. 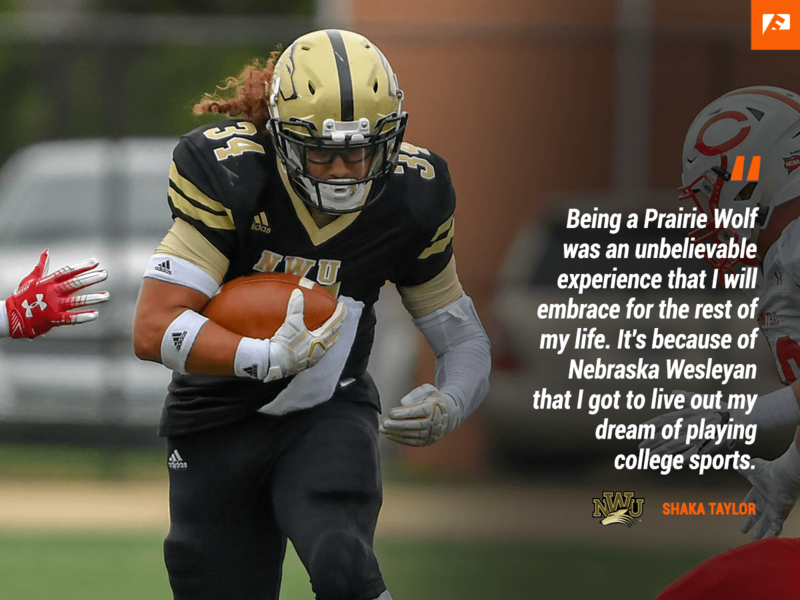 It's because of Nebraska Wesleyan that I got to live out my dream of playing college sports. I am fortunate to have made so many lasting memories but it is especially the people that helped me succeed that will always have a special place in my heart. After graduation, I plan to continue my dream of playing football at the next level. My goal is to make it to an NFL Scouting Combine to see if I have what it takes to play professionally. If that doesn't work out, I would like to stay involved with sports either way and see myself working in the coaching field to help other athletes thrive and excel.